Ultraviolet water purification lamps produce UV-C or "germicidal UV", radiation of much greater intensity than sunlight. Almost all of a UV lamp's output is concentrated in the 254 nanometers (nm) region in order to take full advantage of the germicidal properties of this wavelength. Most ultraviolet purification systems are combined with various forms of filtration, as UV light is only capable of killing microorganisms such as bacteria, viruses, molds, algae, yeast, and oocysts like cryptosporidium and giardia. UV light generally has no impact on chlorine, VOCs, heavy metals, and other chemical contaminants. Nevertheless, it is probably the most cost effective and efficient technology available to homeowners to eliminate a wide range of biological contaminants from their water supply. Recent testing has also shown that UV can be effective at destroying certain VOC's, although we would not specifically recommend the technology for VOC reduction. UV water treatment offers many advantages over other forms of water treatment for microbiological contaminants. Most importantly, it does not introduce any chemicals to the water, it produces no bi-products, and it does not alter the taste, pH, or other properties of the water. Accordingly, in addition to producing safe drinking water, it is not harmful to your plumbing and septic system. Furthermore, it is easy and cost-effective to install and maintain without any special training. Trojan Technologies, manufacturer of the Viqua (Trojan) UVMax line of household ultraviolet sterilizers, and R-can, which makes the popular Sterilight brand of UV sterilizers, are pioneers and world leaders in the field of UV water treatment. These companies even manufacturer large UV sterilization systems that can be used by municipalities and regional water districts for large-scale water disinfection. Ultraviolet purification uses a UV light source (lamp) which is enclosed in a protective transparent sleeve (usually quartz). The lamp is mounted such that water passing through a flow chamber is exposed to the UV-C light rays. When harmful microbes are exposed to the UV rays, their nucleic acid absorbs the UV energy, which then scrambles the DNA structure of the organism. The cell is rendered sterile and can no longer reproduce. The cell is now considered dead and is no longer a threat. UV treatment is an excellent choice to eliminate biological contamination from most home drinking water, whether your home is on a municipal water system or untreated private system (well, lake water, etc.). 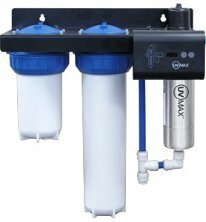 Its sole purpose is to kill harmful biological contaminants, and therefore should always be combined with other forms of filtration (GAC / carbon block, KDF, or reverse osmosis) for reduction of heavy metals, chlorine, VOC's, and other chemical contaminants. What Contaminants Does UV Remove? There are no micro-organisms known to be resistant to UV, unlike chlorination. UV is known to be highly effective against bacteria, viruses, algae, molds and yeasts, and disease causing oocysts like cryptosporidium and giardia. In practice, bacteria and viruses are the cause of most major waterborne pathogenic diseases. Of these enteric viruses, hepatitis virus and Legionella pneumophila have been shown to survive for considerable periods in the presence of chlorine, but are readily eliminated by UV treatment. For most microorganisms, the removal efficiency of UV for microbiological contaminants such as bacteria and viruses generally exceeds 99.99%. Specifically, the following are moved to an efficiency of greater than 99.99%: E-coli, Salmonella typhi (Typhoid fever), Salmonella enteritidis (Gastroenteritis), Vibrio cholerae (Cholera), Mycobacterium tuberculosis (Tuberculosis), Legionella pneumophila (Legionnaires' Disease), Influenza Virus, Polio Virus, and Hepatitis A Virus (better than 90%). Countertop UV systems are generally not recommended for removing oocysts such as giardia and cryptosporidium unless equipped with a 0.5 micron carbon block pre-filter since the exposure time the contaminant has to the UV ray is not always long enough to provide an adequate UV dose for disinfection of these more complex organisms. Whole house UV systems like the Trojan UV Max on the other hand, are capable or killing waterborne oocysts at household flow rates when a properly sized model is selected for the application. one of the few affordable technologies for the home that effectively kills the majority of bacteria, viruses, and other harmful microorganisms. UV lamps (bulbs) require annual replacement to ensure optimal performance. UV lamp performance, just like any other light source, will slowly diminish over time. Beyond one year, there is no assurance that the UV light emitted from the bulb will provide sufficient disinfection. Remember, UV light cannot be seen. The bulb may still produce light, but not necessarily UV rays. The quartz sleeve does not need replacement unless it gets broken, however, it should be cleaned several times per year (outside only). Ultraviolet (UV) light is at the invisible, violet end of the light spectrum. Even though we can't see UV light, we are exposed to UV rays from all light sources, including the sun. How does ultraviolet light purify water? UV-C rays penetrate the cells of harmful bacteria and viruses in our drinking water, destroying their ability to reproduce. Without this ability, these organisms die and no longer pose a health threat. It is a simple but very effective process, with the system destroying 99.99% of harmful microorganisms. Why not use chlorine instead? Chlorine changes the taste and odor of water. Chlorinating also produces harmful by-products called Trihalomethanes (THMs) which are linked to incidence of cancer. Does a UV system use a lot of energy? No, the UV unit will use about the same amount of energy as a 60 watt light bulb. It is a cost effective, natural way to increase water quality. Why do UV purifiers require sediment pre-filtration? UV systems require pre-filtration to maintain effectiveness as sediment and other contaminants in the water can create a "shadow" which prevents the UV rays from reaching and disinfecting the harmful microorganisms. How often does the UV light bulb (lamp) need to be replaced? It is essential that you change your UV lamp annually. The ability of the lamp to emit UV light decreases over one year in operation. Remember - UV light is invisible! Even though the lamp is still glowing after one year, there might not be enough UV light reaching your water to be effective. How often do your need to replace the sleeve? The sleeve doesn't need to be replaced unless it is broken, but it will need to be cleaned several times a year in order to keep the bulb effective in delivering high water quality.